What heck IS an omega fatty acid? Fatty acids are both sources of fuel for the body and structural components of our cells. There are 11 different types of fatty acids but we are going to focus on 2, specifically, that can have a profound effect on your health…or lack thereof. Omega-3 and Omega-6 fats. Both are essential fatty acids, which means they can’t be produced by the body, and both are needed for optimal health. The term “ omega” just refers to the position of its chemical structure. You’ve probably heard you should be eating foods rich in Omega-3 fats or taking a quality Omega-3 supplement, but you probably haven’t been told, or learned, WHY. It comes down to the modern American diet. As I mentioned earlier in this article, the ratio of these fatty acids is of utmost importance. When we evolved as hunters and gatherers our diet of fish, animal protein, some nuts and seeds and a variety of wild plants provided us with the ideal amounts of these fats. Our current day diet, however, does not. With all the processed foods, man-made trans fats and plant-based omega sources, the average diet is too rich in Omega-6 which has drastically skewed this ratio. Too much Omega-6 can easily become inflammatory causing tons of problems for your body. It can increase the risk of heart disease, affect the immune system, disrupt hunger signals and hormones, lower metabolism, and increase insulin resistance to name a few. Although research shows our dietary intake of omega 3 fats is actually around the same amount as our hunter and gatherer ancestors, the issue arises from the increase of omega 6 fats in our current day diets; this increase causes a need for increased omega 3’s to keep harmony with the ratio between the two. Omega 3’s are critical because become part of every single cell in our body. They lower inflammation in the body by the balancing pro-inflammatory agents produced by an excess of Omega-6. Omega-3 fats are important for a healthy mind because they’re highly concentrated in the brain and nervous system. A deficiency can cause to a loss in mental clarity, decrease focus and concentration, and has been linked to many psychological disorders such as ADHD, depression, and anxiety. Omega-3’s also optimize our metabolism. Our metabolism is controlled by more than just our thyroid, it comes down to our cells and how they communicate. Omega 3 fats are part of the cell membrane, and too little Omega-3 can affect how well the cells use and transfer energy or “communicate”. This can have all sorts of effects on your metabolism, impacting how efficient it is. 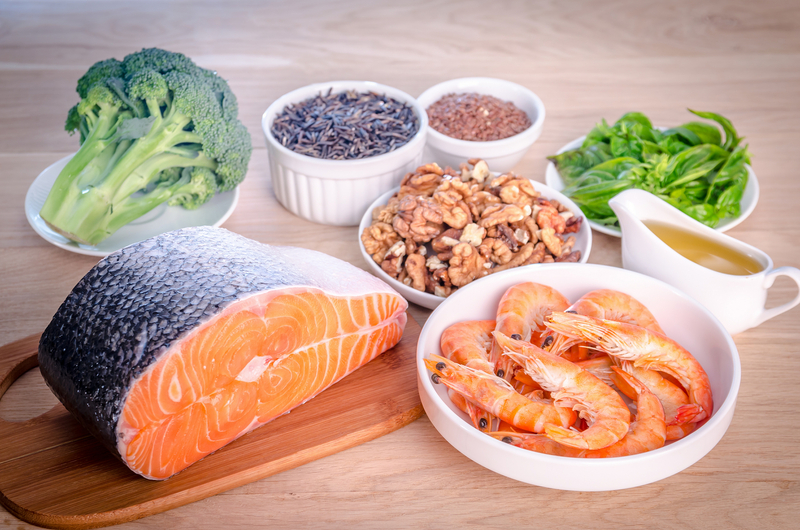 So, what can you do to make sure you have the right amount of Omega-3? 1. Limit sources of processed and high omega -6 foods and oils such as sunflower, corn, and soy. Instead opt for choices like olive, walnut, coconut oil or avocado. 2. Eat quality, WILD CAUGHT fish. Eating two to three servings of oily fish such as salmon, mackerel or trout per week is recommended but beware- farm-raised fish are not equal to their wild-caught counterparts. The average farm-raised fish is fed a very different diet than it would have in the wild, which is shown to skew the amount of Omega-3 to Omega-6 (and that’s not to mention the parasitic infection rate and over-use of antibiotics) Research shows, some farm-raised fish have as much as five times more Omega-6 than fish from a wild source. With the average diet already high in omega-6, this would just be adding fuel to a fire. If you eat fish make sure its wild caught! 3. Take a quality Omega-3 supplement. Although eating a diet of fresh wild caught fish is ideal, we all know it’s not that easy. Not only do you have to source the fish and learn how to prepare, but you also have to be concerned about contaminants like mercury and other toxins. This is why I take other steps like taking a quality omega 3 supplements like the 1stphorm Full mega and try to avoid all fried and processed foods and oils. And to be totally honest, I’m not always perfect. I will indulge here or there. Let’s be real, we aren’t living as we evolved as hunters and gatherers or foraging for our food lol. Sure, I eat really well 80% of the time, but the 20% I am social and sometimes eat for enjoyment. This is why I am so big on using supplements to make sure I’m still giving my body these essential nutrients. And don’t forget, quality is important here because good supplements are key… It’s important to be particular about the quality of your fish, meat, and supplements (I know I am!! ), and if you invest in quality sources, things like taste shouldn’t be an excuse!